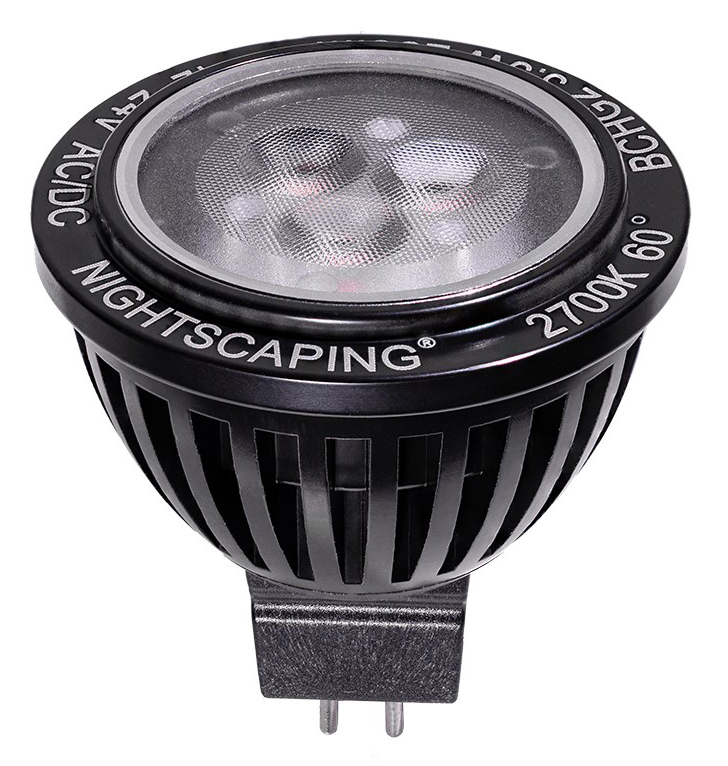 Since the introduction of LEDs (Light Emitting Diodes) into the low voltage lighting scene, manufacturers have created two distinctly different lines of products for the outdoor lighting industry. They are solid state lighting and LED replacement lamps. 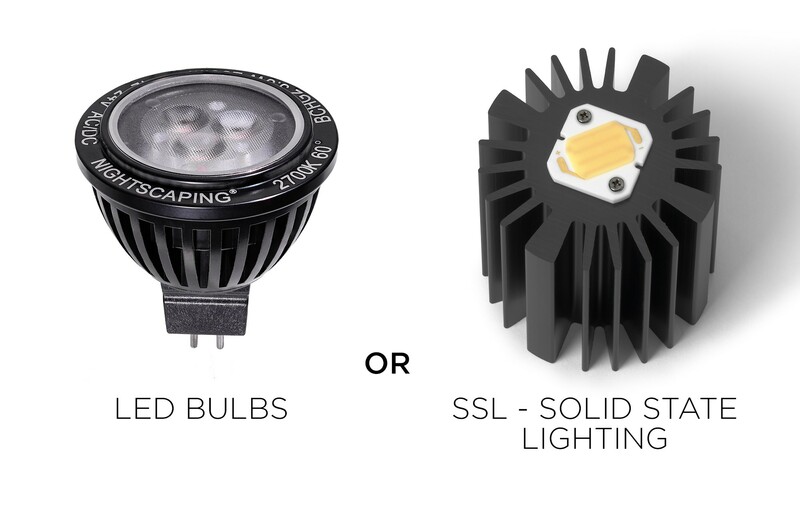 Let’s take a brief look at solid state vs LED bulbs for outdoor lighting. SSL, or Solid-State Lighting, is a term used to describe an LED luminaire that is a complete lighting component built for a specific application. These systems are generally more compact than the traditional “lamp” driven lighting system due to the more compact nature of the LEDs themselves. These systems are comprised of an LED chipset and lens that is thermally bonded to a fixture body. They are designed to pull heat away from the LED board through a series of external fins. These fins are used to increase the surface area of the fixture to the outside air for cooling purposes. SSL types of light fixtures generally have a permanently sealed fixture body to keep moisture and air out of the inner components promoting longevity. For more than 50 years, low voltage lighting systems have employed the use of miniature incandescent and halogen lamps to illuminate gardens across the world. When the LED came along, around 2005, a solution was needed to upgrade the millions and millions of existing lighting systems out there, without incurring the expense and utter waste of having to completely tear out all those systems. Enter the LED bulb. LED bulbs are constructed in such a way, that they mimic the same shape and size as their halogen and incandescent lamp counterparts. They fit in all the same light fixtures that have been used for years, but at a fraction of the energy consumption. This allows us to use the same tried and true brass, copper and stainless-steel lighting fixtures we have grown to love. But now we have a much more energy efficient option. Lamps can easily be swapped out to brighter versions with differing beam spreads or color to accommodate landscape changes over time where an SSL cannot. These LEDs are placed in fixtures that are slightly more susceptible to the elements, which can reduce service life also. Lighthouse Outdoor Lighting® has found that LED bulbs are the most adaptable and cost-effective option for our clients today. LED bulbs give us the ability to upgrade thousands of our client’s existing halogen systems to LED, without the high cost and waste of replacing the entire brass fixture. LED bulbs also allow maximum flexibility to design our initial lighting plan. We can still make subtle tweaks and changes very easily after the installation has been completed. The LED bulb is quickly becoming one of the least expensive components in our lighting systems. 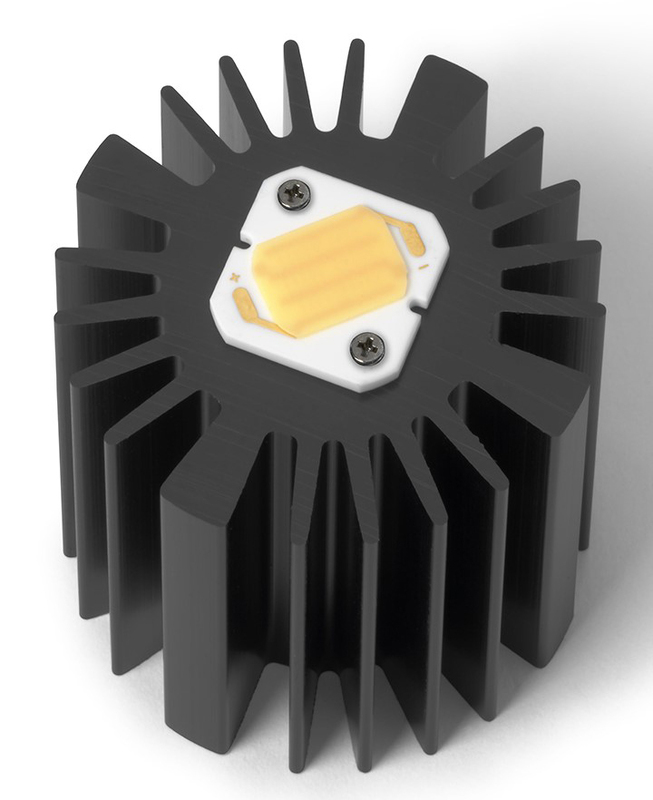 Efficiency in the manufacturing processes and better standards of quality control are beginning to make LED lamps nearly as affordable to replace as a quality halogen lamp. Prior to LEDs, Lighthouse used to change out all halogen lamps on an annual basis to keep the lighting looking fresh and even for our clients. With lower and continually falling costs of LED bulbs, we now recommend a complete LED bulb re-lamp every three years to keep the light fresh. This is a good way to keep up with the current technology and quality of LED bulbs that are continually hitting the marketplace.